A life size model of Wonder Woman on display at New York Comic Con 2015 for the upcoming Batman v. Superman movie. Photo credit to Peter Parrella at SkeletonPete.com. Human beings have an unconscious need to identify with those around us, to draw cues from our environment and to connect with the faces we see. We’re inspired by the characters we grow up with in the books we read, or see in our favorite films or tv shows. Literature and graphic novels/comics have taken the lead in creating complex, multidimensional characters (both male and female) of substance. But tv/film has a greater reach to broader audiences and mass appeal. Seeing an image can reinforce something we already know – see that same image over and over again, and how much more powerfully ingrained does it become in our subconscious? This is why it is critical to have live action, visual representations of ourselves, as not only independent and capable, but also powerful. 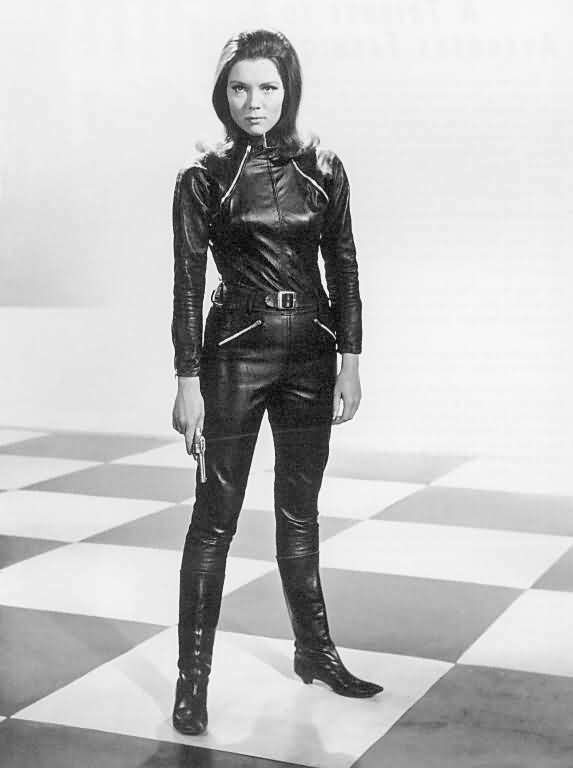 The elegant, but deadly Mrs. Emma Peel as portrayed by Diana Rigg in the 1960s British spy series The Avengers (also starring Patrick Macnee). When we’re children, we believe anything and everything is possible. But girls quickly learn that’s not true, at least, not for them. Boys believe they can be Superman, Batman, or Spider-Man. When I was a little girl, I let my imagination soar with Wonder Woman, Batgirl, the Bionic Woman, Uhura, and Mrs. Peel – even Barbara Wright and Sarah Jane Smith on Doctor Who. But what about girls after me? Who did they grow up with? Who were their role models? We need to see the world as we wish it would be. We look for people who look like us to tell us it’s OK to BE us. If we are constantly seen as background decoration, sexualized, victimized and powerless (or powerful, but only if we’re sexualized or bitchy/angry/bad girls/mean girls), then what message does that send? Women as subservient, hollow or embittered beings? To gain any ground at all, you must sacrifice your body, your honor and ethics. Because you can’t possibly be good, moral, intelligent, have healthy relationships (with men and women) or have high-powered careers and still be yourself, can you? The beautiful Nichelle Nichols as Uhura in the classic 1960s sci-fi Series Star Trek. In recent years, comic book inspired films and TV shows have hit an all-time high. The Super Friends I grew up with are back in many forms. While overjoyed, I was also dismayed that Batgirl, Supergirl and especially Wonder Woman, have been largely absent from the vast landscape for many years (at least in live action form since the 1970s – not counting a failed attempt at a Wonder Woman pilot or the CW’s Birds of Prey series)… even though Wonder Woman comics have been around since the 1940s. Many of us got tired of hearing studio exec excuses, “Superhero Girls don’t sell”. Previous superpowered females (featuring leading ladies Supergirl, Catwoman, Elektra) failed to impress, and have been cited over and over again as examples as to why it is now 2015 and we still don’t have a Wonder Woman movie (one is finally due out in 2017). Market forces determine what we see. Really? I’m female. I have money to spend and I want to see more of my gender as powerful leading ladies. More importantly, I want my friends’ children to see it too – especially their young daughters. One friend, a schoolteacher, reported to me that most of her students did not even know what feminism or the suffragist movements were. That’s telling and disconcerting. As I’d feared, we’ve taken a step backwards in gender equality since the 1970s. Apparently, we’d come a long way and then promptly had forgotten what it meant. Girls are discouraged from taking risks, from entering into scientific fields, or entering into law enforcement and the military. It’s not lady-like. I’d been similarly discouraged when I was younger, but I’d seen my heroes excel at math/science/martial arts/law enforcement, so I believed it was possible. At one point I wanted to be a detective, a lawyer and a forensic scientist. I didn’t become any of those things, but I toyed with them all as career options because I felt it was possible. The Bionic Woman and Mrs. Peel were secret agents for heaven’s sake! Beautiful, brainy and bold! That what’s I wanted to be too! Whoopi Goldberg often relays a story from her youth. She was inspired by the beautiful Nichelle Nichols. Seeing a woman of color in a prominent role in the hit sci-fi series Star Trek gave her hope. 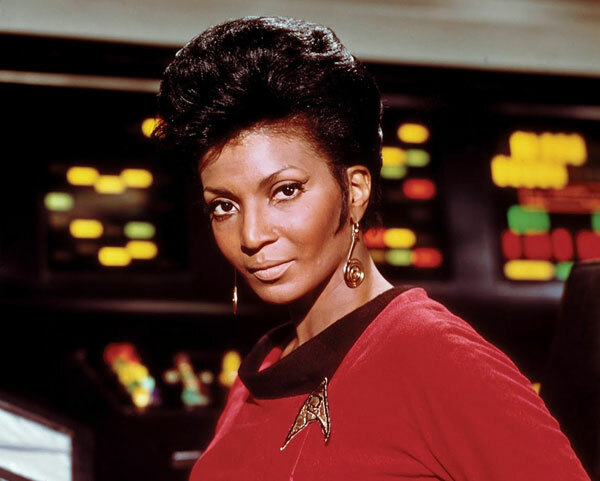 She credits Nichelle’s portrayal as Uhura for inspiring her to become an actress herself, and one with with a message… diversity and gender equality matter. Representation matters. For those who don’t feel this is necessary, I would argue you are already at the top of the food chain. Congratulations. This isn’t aimed at you. It’s for others who feel they don’t matter, because they’ve been getting the wrong message. 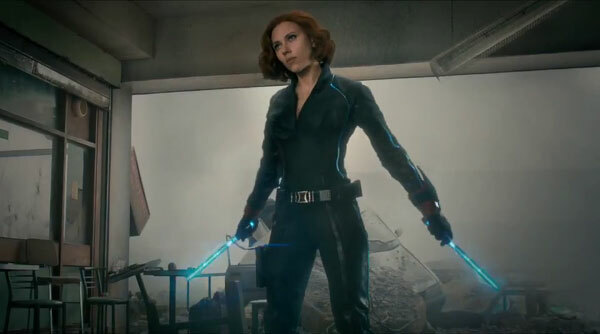 Natasha Romanoff (or Romanova), aka Black Widow, in The Avengers as portrayed by Scarlett Johansson. Largely ignored when it comes to representation in media, let alone in badass, kickass roles where women are the protagonists, we want to stand up and be counted. We want inclusion. We want to be more than just the girlfriends or sidekicks, or the hot vixen of the week. And while film execs say market forces and “box office trends” determine what we see, we want to BE the power – the heroes and the leaders – a driving force in film in television. Women make up more than 50% of the population, but you wouldn’t know it based on what we see in the media. In Marvel’s Avengers, Black Widow was featured prominently, but many took issue with her role being marginalized in general, as she wasn’t given a standalone film, like her male teammates (Thor, Captain America, Iron Man, and The Hulk). 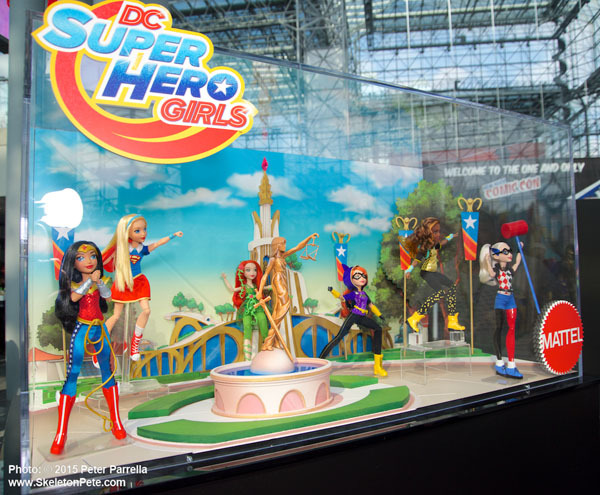 DC SuperHero Girls by Mattel on display at New York Comic Con 2015 at the Javits Center. Photo credit to Peter Parrella at SkeletonPete.com. From Marvel’s Jessica Jones to IAmElemental, New York Comic Con 2015 (NYCC 2015) proved one thing, women are a force to be reckoned with. Geek Girls took to the internet and the results are evident. 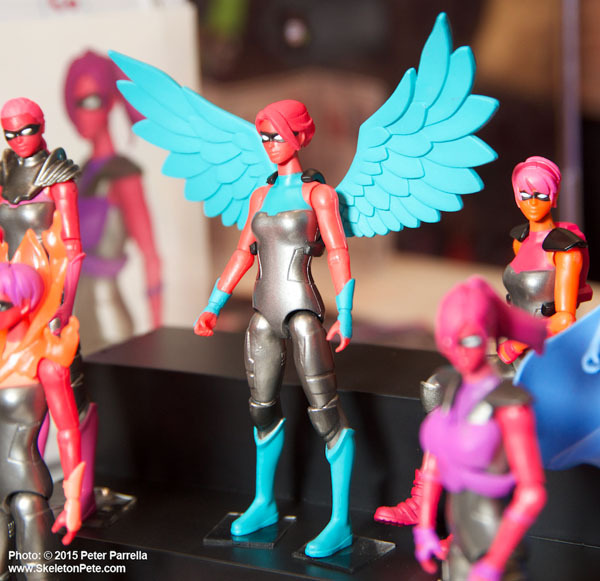 On the NYCC floor, newly minted IAmElemental action figures and Mattel’s DC Superhero Girls were proudly on display. No longer in the shadows, they took their rightful place next to Batman, Superman, Spider-Man, Captain America and Wolverine (some of MY favorite male superheroes). IAmElemental action figures were on display at New York Comic Con 2015 and at Sweet Suite15 this year. Photo credit to Peter Parrella at SkeletonPete.com. A (Wo)Man’s World: Closing the Gender Gap in Pop Culture – including speakers from the UN for Women’s “He for She” campaign. Marry, Do or Kill? What Will it Take to Shatter Female Stereotypes in Comics? 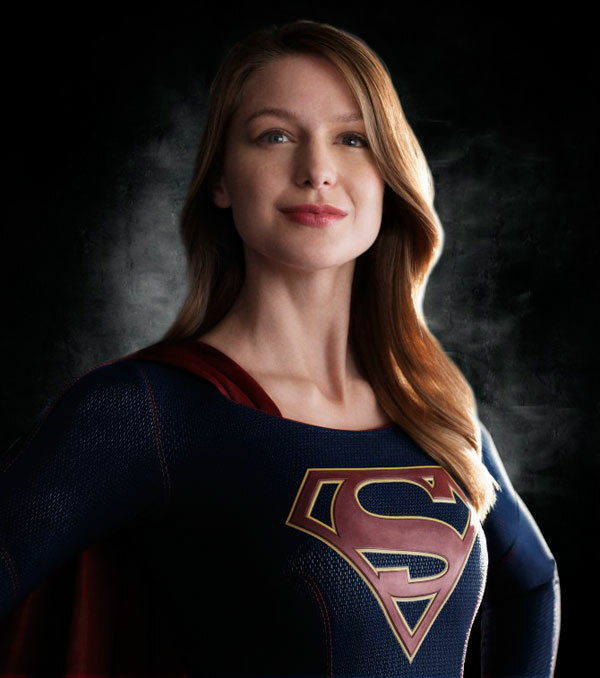 Melissa Benoist as Kara/Supergirl on the new CBS Series Supergirl debuting tonight, Monday, October 26, 2015. Tonight, CBS airs the highly anticipated pilot for Supergirl. It’s been a while since we’ve seen her live – not since Laura Vandervoort played her on Smallville, or Helen Slater starred in the poorly received theatrical release in 1984. Highly anticipated, but also being viewed critically, some early reviews of Supergirl have been mixed. Some are worried it might be too “fluffy” or saccharin – too (dare I say it?) girly! Can Kara become the hero our little girls need? Will she be an inspiration to a new generation and become what Wonder Woman, Uhura, Mrs. Peel and Sarah Jane Smith were for me? Time will tell. In the coming weeks/months, I’ll attempt to take a look at the rising trend in The Super Woman, and female-centric role models for empowerment in pop culture, to see if these women are the heroes our little girls (and boys) need and deserve. Stay tuned. Supergirl airs tonight, Monday, October 26, 2015 on CBS at 8:30pm EST.